The PaperPhone is a smartphone prototype that redefines "thin" for cell phones. Take a look at this picture of the device, which does everything that a cell phone can do, store books, play music and (yes) make phone calls. The phone uses "bend gestures" detected by special sensors; when bend gestures are repeated, they trigger changes in the device's behavior. Make calls, select songs and interact with e books by bending the phone. "This is the future. Everything is going to look and feel like this within five years," says creator Roel Vertegaal, the director of Queen's University Human Media Lab. "This computer looks, feels and operates like a small sheet of interactive paper. 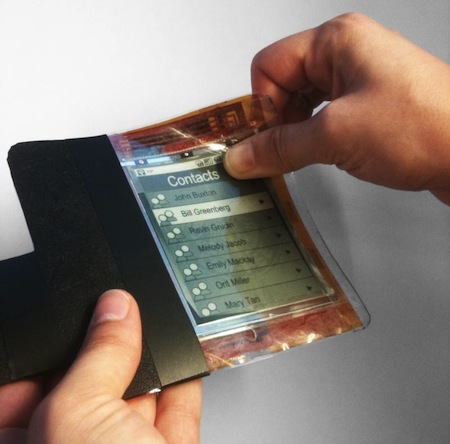 You interact with it by bending it into a cell phone, flipping the corner to turn pages, or writing on it with a pen." The development team included researchers Byron Lahey and Win Burleson of the Motivational Environments Research Group at Arizona State University (ASU), Audrey Girouard and Aneesh Tarun from the Human Media Lab at Queen's University, Jann Kaminski and Nick Colaneri, director of ASU's Flexible Display Center, and Seth Bishop and Michael McCreary, the VP R&D of E Ink Corporation.